Still have both the revolver pens and a couple of mini-bolt action pens for sale. The last mini-bolt action is plum in gun metal, but I don't have a picture yet. I had a busy day on yesterday and turned a bunch of new pens before the playoff games started. Here are eight new pens for you guys. 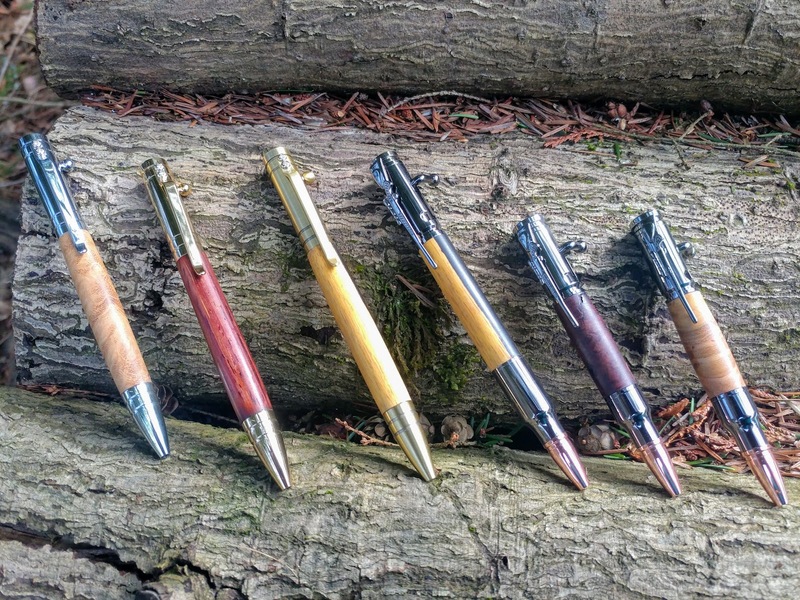 All of the bolt action pens (Tec, regular & mini) are $55 each, the revolver pens are $65 each. The three pens on the left are new pen / stylus combo "Tec" bolt action pens I've started making, so you can use the pen or the stylus on the other end with your phone or tablet. They come with two tips, the plain ones like you see here, and stylus tips so you can choose your look. 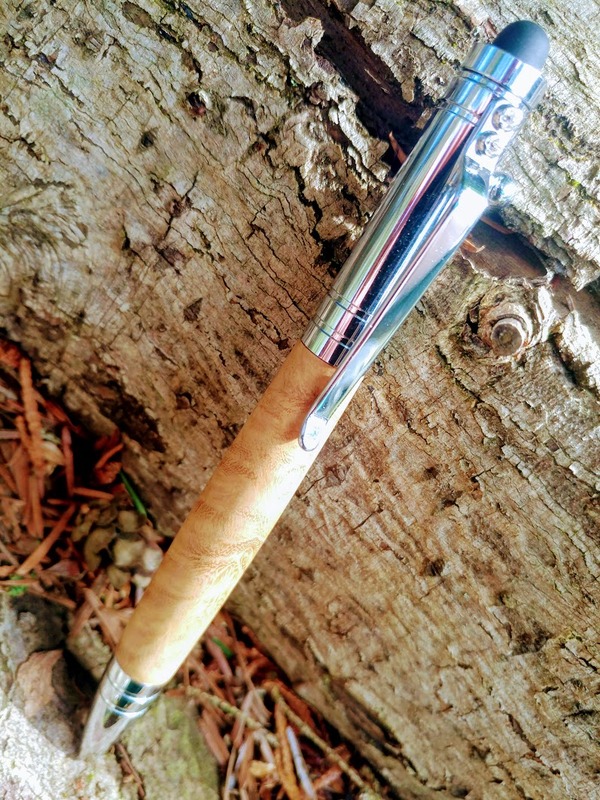 First is a chrome Tec pen in Black Locust burl(SOLD), then a 24kt gold pen in Bolivian Rosewood (SOLD) followed by another in antique brass & Mpingo(SOLD). Nice, huh? Next are two mini bolt actions, both in gun metal, one from Manzanita burl, and the last one is Plum(SOLD). 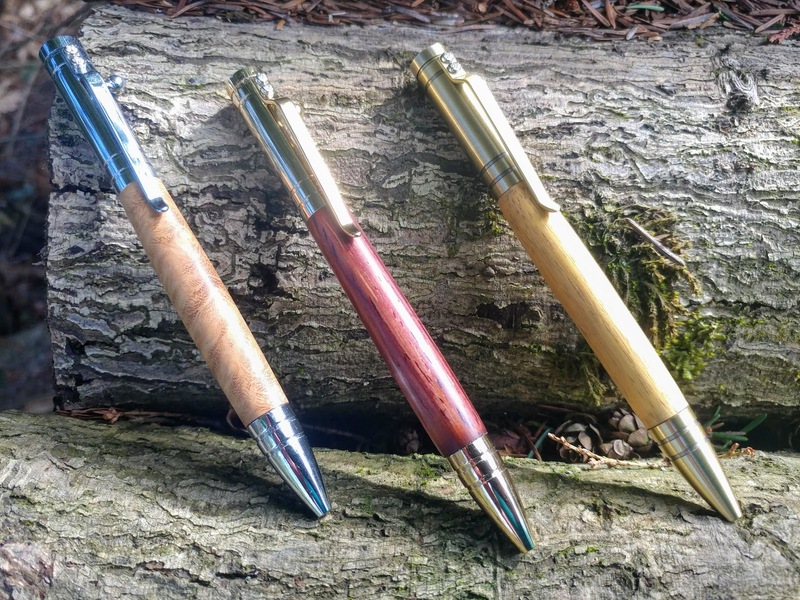 Here are three Mpingo pens all made from the same piece of wood. Generally Mpingo is pitch black with maybe a bit of the cream sap wood showing, but this is the opposite with just a stripe of the heartwood in the sap wood. That makes it a bit harder to turn as the sap wood is fairly soft, while the heartwood is so hard (think Ebony) that if you keep your tools sharp enough, it can be taken off the lathe without sand paper ever touching it. I love working in it.. 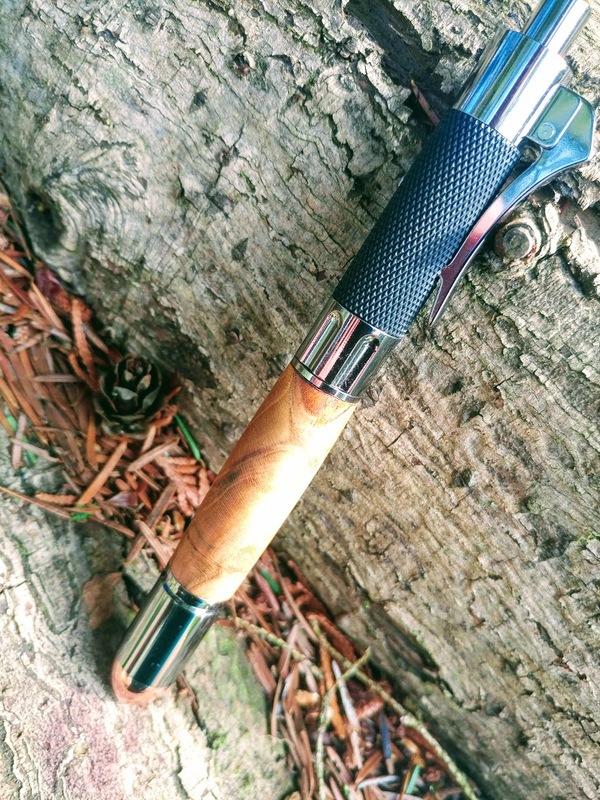 This one is a chrome Tec pen made from Black Locust burl and you can see the stylus tip is in place. 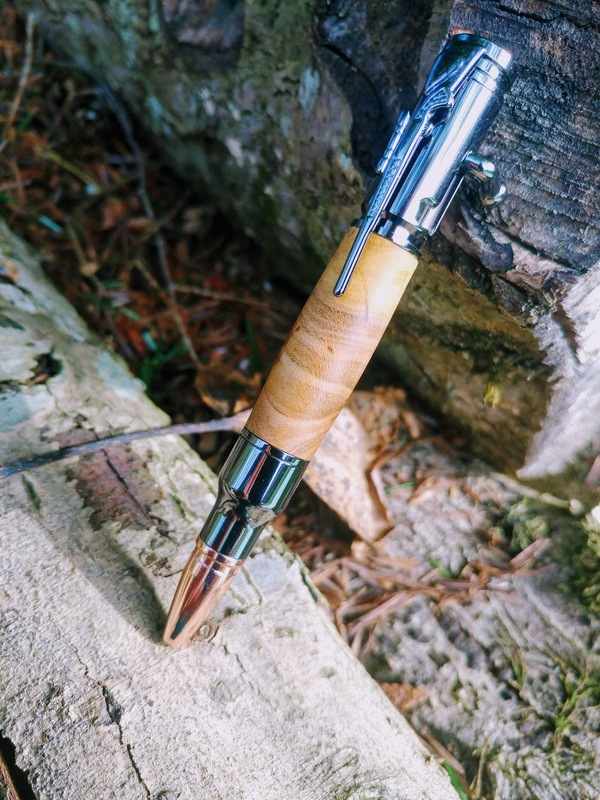 This revolver pen is made in gun metal with Plum. Can you find the repair from this thread? 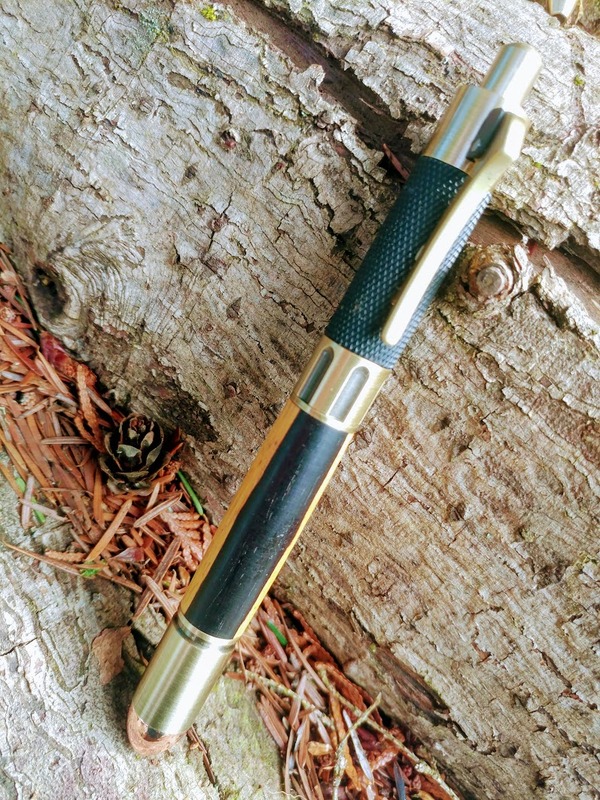 This revolver pen is in antique brass & Mpingo (same piece the Tec pen was cut from as well as the bolt action). 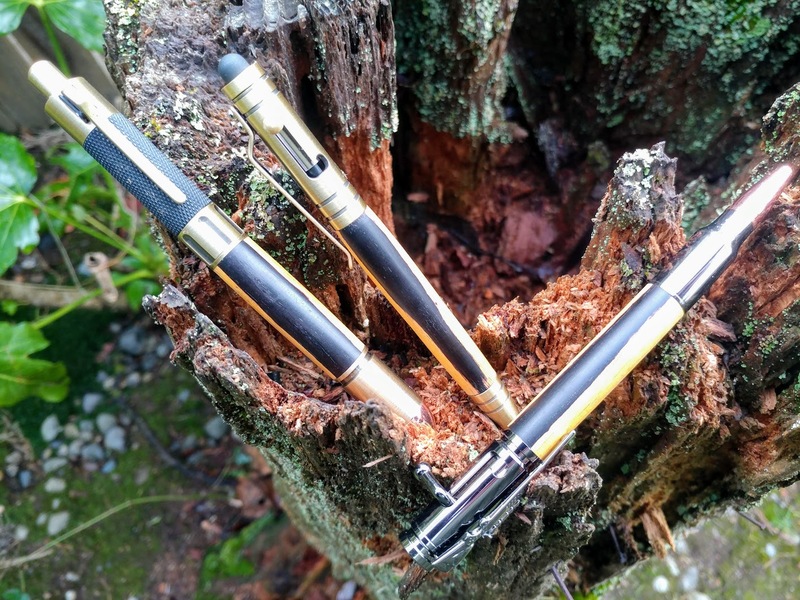 A close up of the three Tec pens with their plain ends. 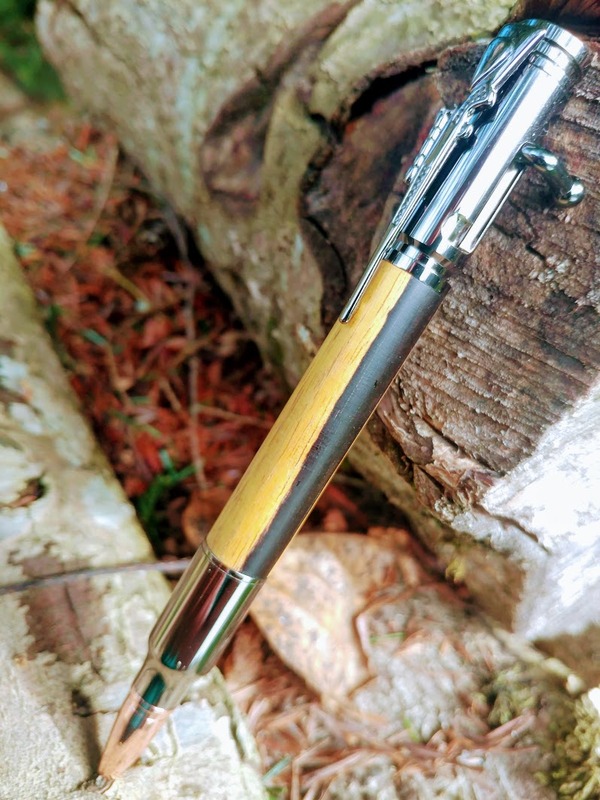 The 24kt gold & Bolivian Rosewood Tec pen with it's stylus end. 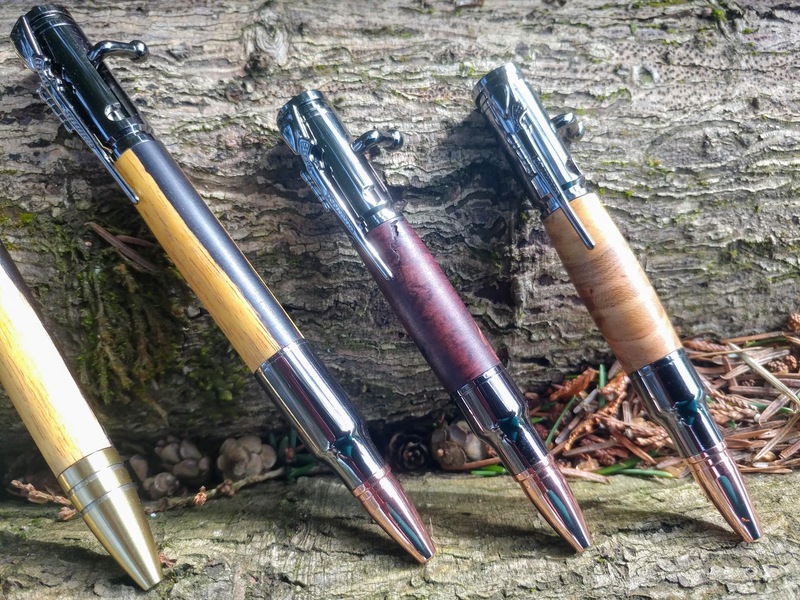 A close up of the three bolt action pens and a peek at the Mpingo racing stripe of the Tec pen to the left. 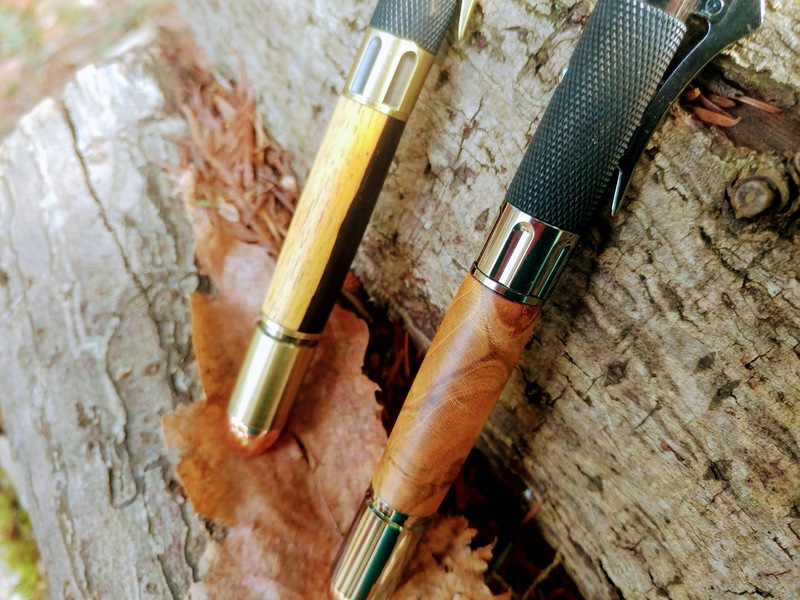 A close up of the two revolver pens. Can you spot the problem child that spit a piece of the barrel at me & needed some ministrations? 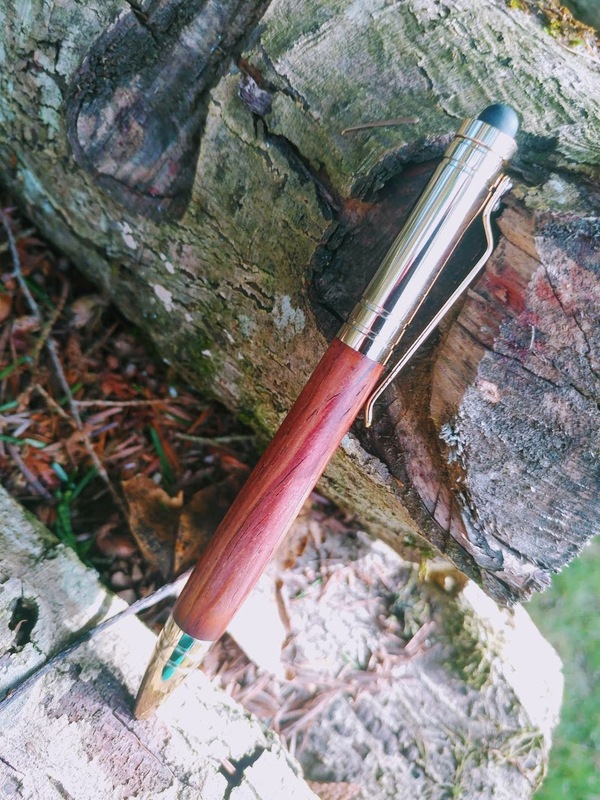 Next is a mini bolt action pen in gun metal and Plum. I love the grain in these pieces of Plum, kind of like looking into broken glass. Don't let the size fool you, it's still very comfortable in big hands (like mine), but also very nice in small hands (like Rita's). 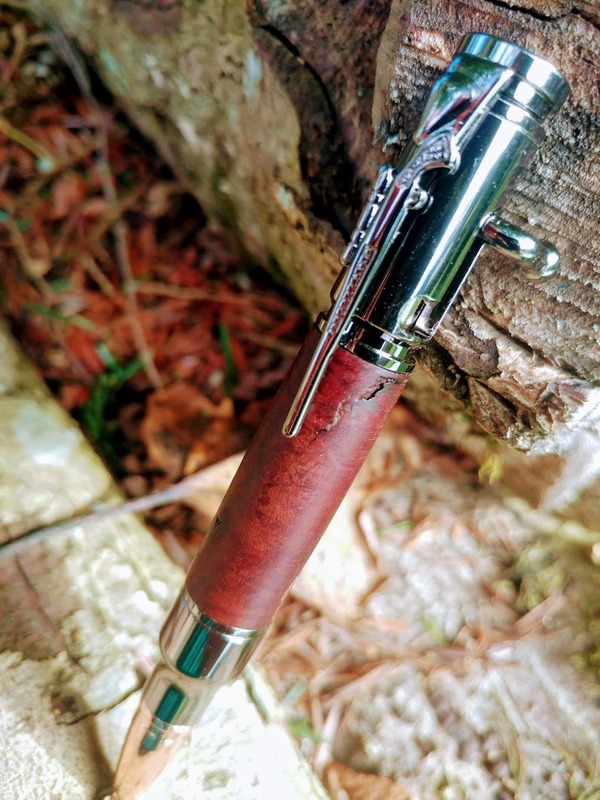 This one is another mini bolt action in gun metal, showing some of the character of the Manzanita burl. This stuff's a bit tricky to turn, gotta keep your tools sharp or it'll crack & split on you. I think this one turned out nicely. 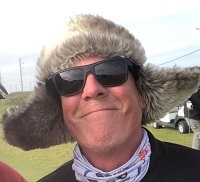 Last edited by delliottg on Sun Feb 17, 2019 4:04 pm, edited 9 times in total. I'll take this one Dave, if its still avail. Let me know how to pay you. It's yours! 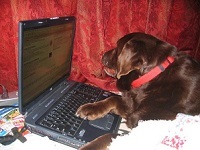 Sent you a PM with particulars. Wow, that got there fast, Rita only dropped it in the mail yesterday. 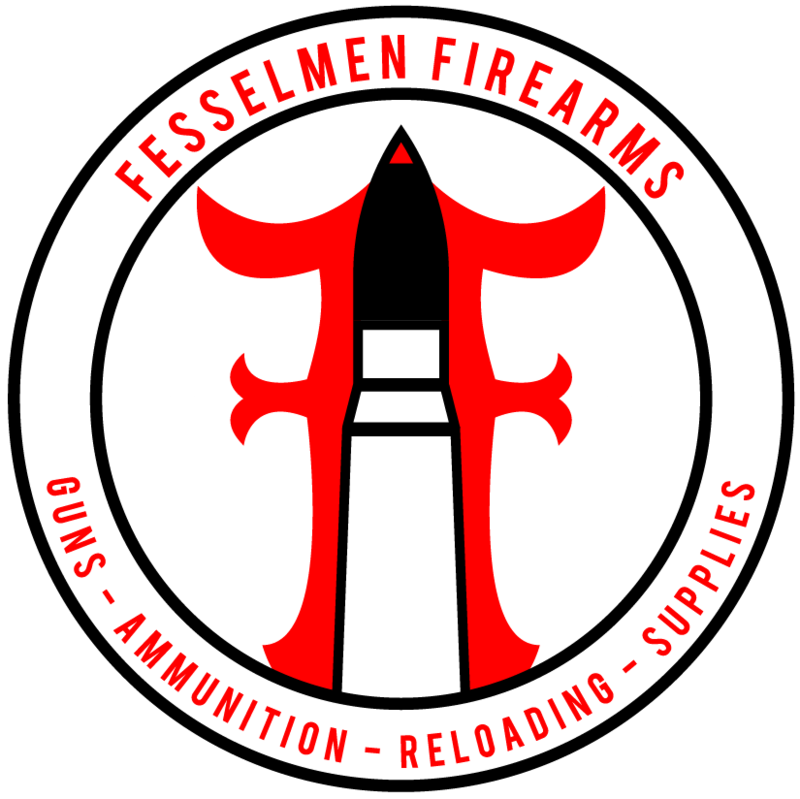 Glad you like it, would love to have seen the look on your wife's face when she got the first picture with the "gun case"! Saturday bump. Still got five pens left. 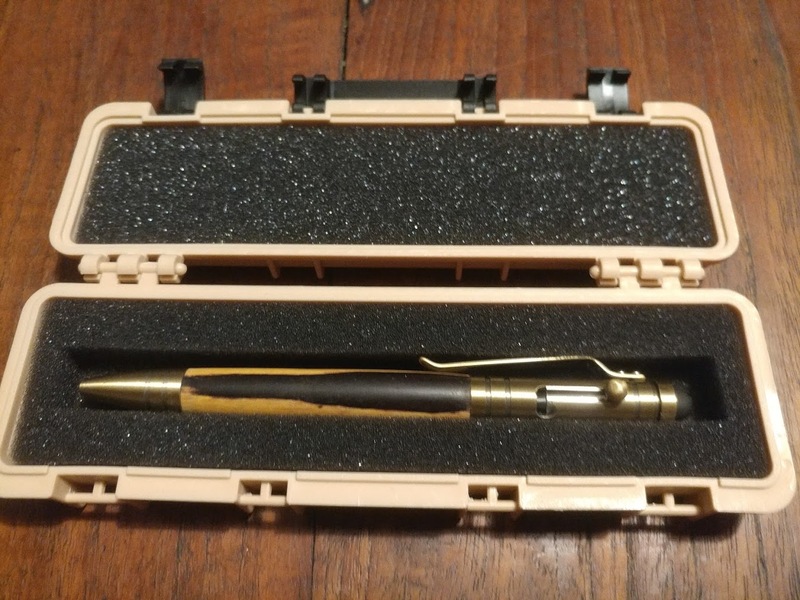 Weekend bumpage with a Mpingo Tec pen in antique brass with a desert tan tactical case. 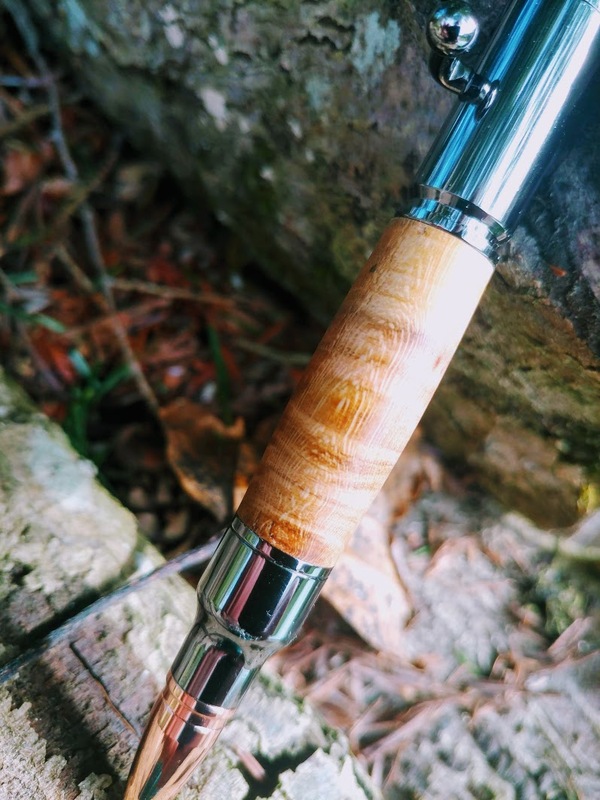 All the Tec style pens are sold out, but I have kits to make several more if you're interested.